Home accessibility is a major factor in ensuring community diversity. Often those looking to relocate face a challenge finding a home which caters to those living in wheelchairs or facing significant mobility challenges. 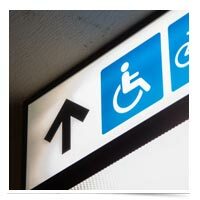 If you think you understand the scope of making a home accessible, you may be surprised at what you’ve overlooked. This is a fairly comprehensive guide, and will give you new eyes when it comes to assessing the accessibility of a home. Definitely share this piece with any aging Baby Boomers in your client database, as well as full-time caregivers!